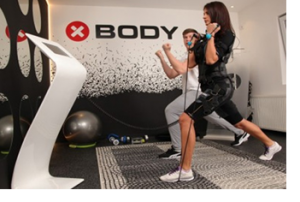 Performance and sport: XBODY is the perfect backup for athletes: The EMS training device in combination with conventional training methods quickly leads to a new level of power and high-speed performance. This training is especially interesting for athletes whose type of sport is governed by speed as specific speed training is needed. Muscle formation and definition: XBODY uses electro muscle stimulation to achieve stronger and more intense muscle contractions than a voluntary exertion can achieve alone. Depending on intensity and individual goals, you can build muscles and achieve better definition while also making them stronger and more responsive – your muscles simply become more efficient. Strength and training: With EMS training you gain strength in a shorter period of time. Individual adjustment of intensity, duration and frequency helps achieve personal training goals quickly, effectively and consistently – no matter whether it’s increasing maximum strength or improving endurance and overall fitness levels.